The greenhouse isn't done yet, but since I'm running out of room on my window sills and laundry room, I figured that I might as well get some things going outside. 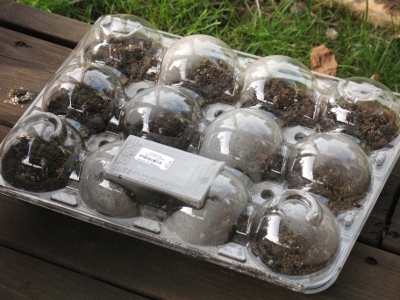 Costco sells apples in these wonderful little containers that function well as little greenhouse-like structures. Dirt goes in the bottom, and because the top of the container is domed like the bottom, any evaporated moisture goes up and then right back down into the same cell. Handy. I've got potatoes that sprouted in my pantry in the apple container right now. 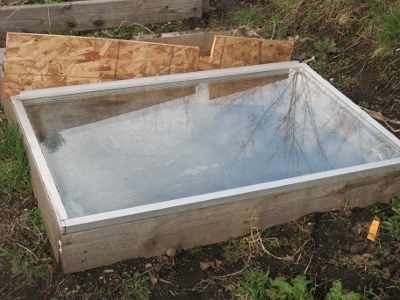 In addition to the 6x4' window panes that I picked up to build my greenhouse, I also got a few sliding glass doors and other miscellaneous windows. This one happened to fit nearly perfectly in one of my raised beds -- it was just a little short in the back. I've got an entire packet of carrot seeds planted under that glass. My understanding is that carrots do not transplant well, but I've never tried and often get funny looking, crooked, two legged carrots anyway. Your garden is huge! Looks great! I was surprised to see record lows expected for the rest of the week (below freezing). Sounded like most of your stuff was cold hardy though. Especially if you keep the glass tops on. I have had the worst luck with transplanting cucumbers. I am 0 for 4 now. I've never transplanted carrots either. I hear that the trick to avoid crooked alien carrots is to make sure that the dirt is SUPER soft. And mixed with wood ash, for best results. My cucumber starts actually died off during that previous frost... so I recently planted some more. I was really excited about a batch of lemon-cucumbers that I planted, but it looks like I'll have to get more seeds if I want to grow anymore. Boo. You have got the right idea man, I just bought me a place two years ago and I have many ideas. I started a garden this year and plan the just keep growing and filling my yard with all kinds of plants. God Bless all that we grow! !